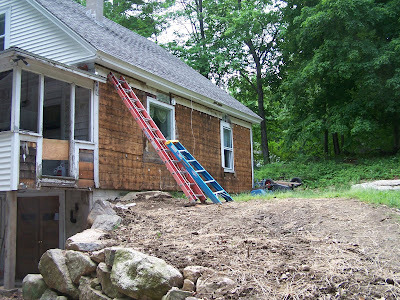 Then...the work has started for the siding on the backside of the house. 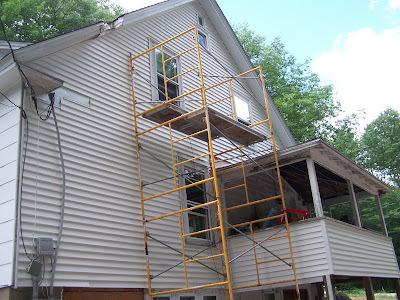 Mr. D and Mr. B (Donovan and Biller) have been here this week in the crazy hot weather tearing off old siding and getting it all ready to reside. 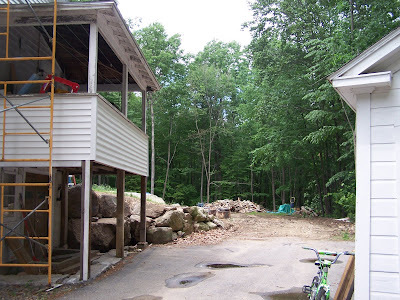 The cool thing about this project is that it looks as though they are going to put a door from where the window in the dining room is...and make a sort of patio/deck type thing out there instead of rebuilding a deck where the old one was! This is happiness for me:) So envision this picture...with a door where the regular sized window is....and a patio with my (Aaron and Lacy's) grill on it!!! Awesome!!!!! I am so happy for you guys. The house is looking great! What a difference some siding makes and the removal of the old broken down deck and stairs. Oh yeah.......cookouts on the back patio........souonds like fun. Awesome! I am glad they followed through with our plan. We suggested the door thing when we were there but at the time they didnt know if they wanted to do it!!! 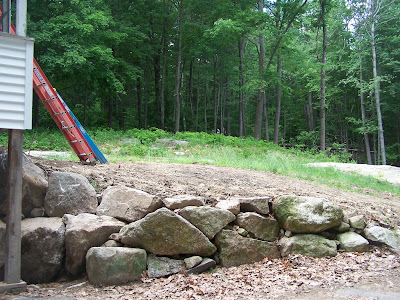 I am so excited to see all this work getting done!!! Thank you again for showing us!!! We appreciate it! It looks really great, I can't wait to see it in person! Thanks for posting the pics!